The research of Nanotechnology in Wang Lab is to use functionalized nanomaterials for drug delivery and tissue engineering. As PI or co-Investigator on several projects, Dr. Wang explored the applications of surface-modified liposomes for targeted drug delivery. 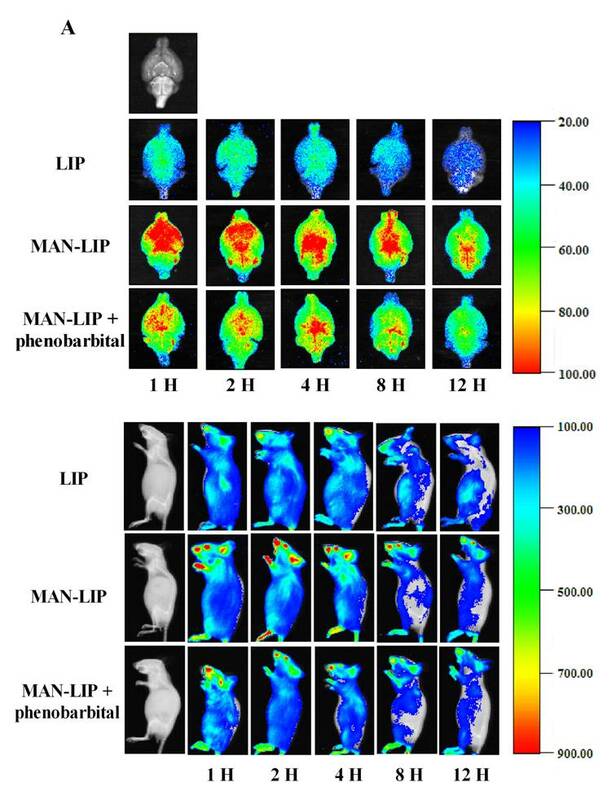 He demonstrated that anti-cardiac troponin I antibody modified liposomes significantly increased the targeting efficiency of oligonucleotides to ischemic myocardium tissues , and tamoxifen modified lipid bilayer can improve pharmacokinetics profile of liposomal daunorubicin with enhanced therapy for breast cancer . He also indicated that P-aminophenyl-α-D-mannopyranoside conjugated liposomes is a promising brain drug delivery system, which was able to penetrate the blood-brain barrier to improve brain delivery and targeting intracerebral regions, especially in cerebellum and cerebral cortex . In tissue engineering project, Dr. Wang demonstrated the feasibility to use nanofibrous mats for dermal tissue regeneration [4, 5]. In vivo images of time-dependent whole brain and body imaging of mice after intravenous injection of surface modified liposomes . 2) Li M, Yu H, Wang T, Chang N, Zhang J, Du D, Liu M, Sun S, Wang R, Tao H, Shen Z, Wang Q, Peng H. Tamoxifen embedded in lipid bilayer improved the oncotarget of liposomal daunorubicin in vivo. Journal of Materials Chemistry B. 2014; 2(12):1619-25.